I'd booked a long weekend at Tioman Genting Happy Inn with a friend, as part of a 2-week exploration of Tioman, because we both wanted to take a closer look at this gorgeous island. We began our trek in Tioman's south, i.e. Genting Village, making our way up north after our stay in Tioman Genting Happy Inn. Tioman Genting Happy Inn is located just north of the Genting Jetty, between Sun Beach and Bayu Tioman Chalet. 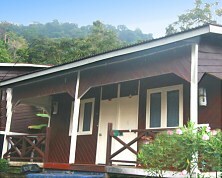 Tioman Genting Happy Inn offers a pretty impressive number of wooden chalets, all sandwiched by a crystal-clear turquoise-colored sea in front and a densely vegetated emerald-green mountain slope behind. As you can imagine, we were in awe every single time we strolled around the Tioman Genting Happy Inn grounds. It's a veritable little paradise. Our particular chalet came with a separate bathroom that included a shower with hot-water facility. The room actually sleeps 4 persons, which meant that we each had a queen-size bed at our disposal. The beds were comfy and we found we slept very soundly, possibly due to the clear sea air. Although I'm sure the fact that we had an aircon that kept the room nice and cool also contributed. Incidentally, apart from the aircon, the room also has a fan, presumably for when things get too chilly, which, surprisingly, does happen every now and again, for instance after a rain shower has just passed through. If you're into seafood, then Tioman Genting Happy Inn is the place to be. They have a restaurant that faces the sea. Having our freshly prepared fish and curry dishes here, whilst the sea is just a stone's throw away, was simply awesome. Naturally, in order to get a closer view of Tioman, we had to do a few excursions. This is another aspect where Tioman Genting Happy Inn delivered, because all we had to do is ask them to set us up and within an hour, we were on our way. All in all, Tioman Genting Happy Inn was a great intro to Tioman. The surroundings are fantastic and the ambience is, as you can expect from Tioman, soothing and idyllic. In fact, given the complete package offered by Tioman Genting Happy Inn, we felt that Tioman Genting Happy Inn is really good value for money. Tip: Tioman Genting Happy Inn is pretty much off the beaten track, so if you want to book a chalet here, call direct on +60 7 799 3048. Alternatively, try faxing them on +60 7 799 1603. If you prefer to book online, you can see if Tioman Genting Happy Inn is on Agoda. After all, quite lot of Tioman hotels and hostels are now.